We had a call from the landlord of a small industrial estate in Birmingham. Recently two caravans and three other vehicles had camped on the main estate road. The tenant businesses on the estate were complaining that it was affecting their trade. The camp was unsightly and their customers felt intimidated. The result was it was putting off their customers from visiting. It was affecting their turnover and profit. The landlord was in discussions with a large supermarket group about taking a warehouse / distribution unit and was concerned that the caravans and vehicles would affect the negotiations. The landlord had served the gypsies notice to move from his industrial estate in Birmingham a few days earlier. He now needed a bailiff company to organise and enforce their eviction. We contacted the local police to arrange their presence in case of any breach of the peace and attended the location that day. The gypsies were evicted from the Birmingham industrial estate by 5pm. Another successful gypsy eviction by Enforcement Bailiffs. 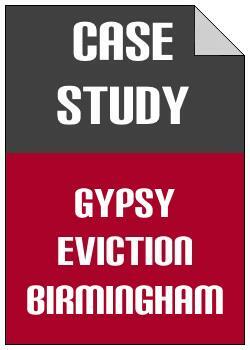 If you need Gypsy Eviction in Birmingham then contact Enforcement Bailiffs.